I’ve used a similar version by Origins (which is no longer in production) a few years ago, I even went through two bottles of the stuff, but stopped using it for really no apparent reason. I wanted to start using it again this summer because I really needed something to brighten up my skin and get rid of old acne marks. But then I realized it was discontinued to I got this newer version. 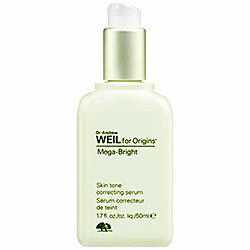 So what did I think of the newer version of this skin tone brightener? In just a short time, about two weeks, the results are pretty amazing. I’ve been using it in the morning as a moisturizer and at night over my acne medicine. The results are pretty quick and noticeable. The old spots I had on my face have faded and more recent ones that have developed are practically gone. I need far less makeup and my skin is really moisturized. I’m loving the results and I will definitely repurchase when this stuff runs out. I also love the price point, its not so expensive that I can’t justify using it twice a day.